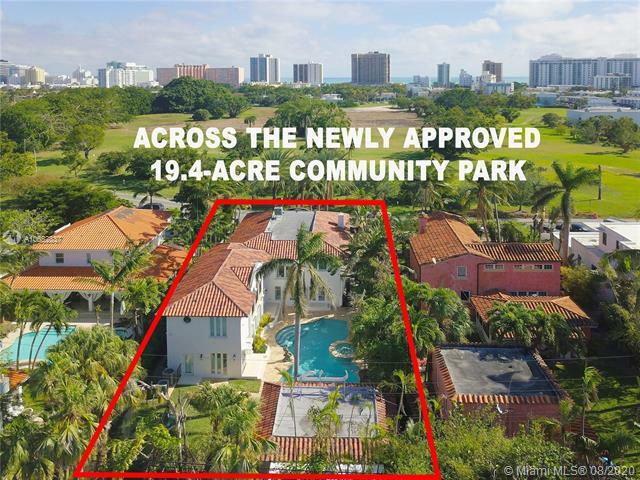 Completely reconstructed in 2009 with a beautiful Mediterranean exterior, & remodeled again in 2017 with modern interior features, this luxury home is ideally located on quiet & central Prairie Ave, next to the Miami Beach Golf Club, Lincoln Road Mall & South Beach. The home features an open floor plan w/a living room w/fireplace, office area, theater w/projector, formal dining with wet bar & chef's kitchen with an island, breakfast bar & spacious family rm. Four bedrooms up, including master w/ a sitting area, private balcony, onyx finished bath & private staircase to the backyard. The secluded backyard comes with a freeform pool with a spa, gym w/steam room & sauna, barbeque & Moroccan-style covered patio w/built-in sitting. Gated home overlooking a beautiful park. Per owner, 5,700 SF.